Our Week 24 2017-2018 girls team coach of the week is Olasaa Solovi of the East High girls basketball team. 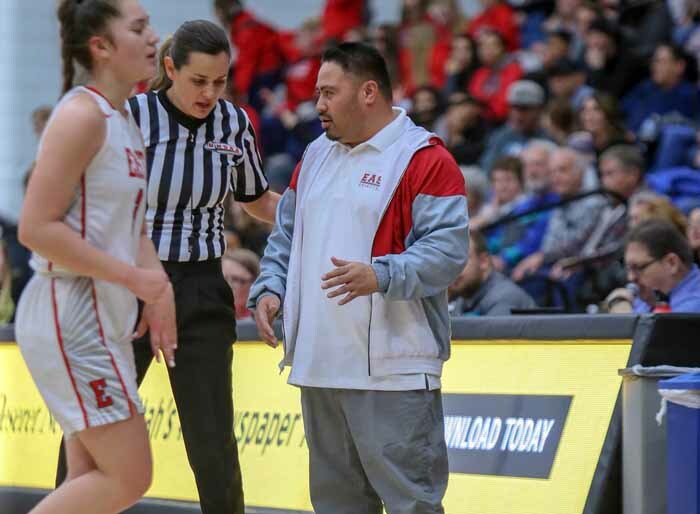 Led by Solovi, East, which has been open since 1913, won its first girls basketball state championship with a 68-48 win over a talented Timpview team. The Leopards raced to a big lead early against the Thunderbirds and never looked back. For East, the toughest battle came in the semifinals, when it faced region rival Highland, which finished in fourth place in the Leopards’ Region 6. East (23-2) struggled to score but managed a 44-38 victory to reach the title game just one year after reaching the state tournament for the first time in nine years. Margarita Satini was the state tourney MVP, but Solovi’s team got this done with a group effort that also featured Liana Kiatu’u, Leilani Falatea, Deserae Falatea and Lani Taliauli. The state championship performance makes Solovi our Anython girls team Coach of the Week for the week of March 5, 2018.